Now you can purchase the all-new BPA-FREE copolyester container with the standard wet blade. 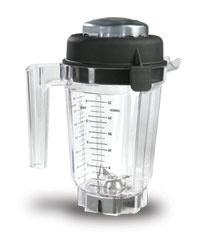 With a 32 ounce capacity, it has enough capacity for single serving soups, smoothies, blended drinks and more. We find the "wet blade" does it all. It will do most all the blending tasks fairly well, and we do not reccomend the Ice or Dry blades, as we feel they are just a "gimmic" to sell you more stuff. How many other blenders have different blade configurations?